If you were ill and doctors couldn't help you, would you have 20 years to wait before medical science discovered the true cause of your suffering and the way to get better? What would it be worth if someone else were able to help you recover and heal - now? Anthony William, the one and only Medical Medium, has helped tens of thousands of people heal from ailments that have been misdiagnosed or wrongly treated or have baffled medical communities. He's accomplished all this by listening to a divine voice - called Spirit of the Most High - that literally speaks into his ear, telling him what is at the root of people's pain or illness and what they need to do to restore their health. Anthony has been called the Edgar Cayce of our time. He's also been compared to Padre Pio. What he does is several decades ahead of scientific discovery. His methods achieve spectacular results, even for those who have spent years and many thousands of dollars on all realms of medicine before turning to him. Now, in this revolutionary book, he gives readers access to all that he has learned in over 25 years of bringing people's lives back: a massive amount of healing information, much of which has never appeared anywhere before. 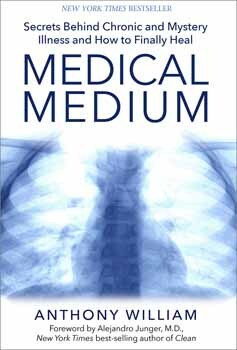 Medical Medium reveals the root causes of diseases that medical communities either misunderstand or fail to understand at all, conditions that wreak havoc with the lives of countless people around the world. And, it explores all-natural solutions, not merely relief of symptoms, but critical information that can address core causes and completely restore a person's health, for dozens of the illnesses that plague us, including Lyme disease, diabetes, adrenal fatigue, Candida, chronic fatigue syndrome, lupus, multiple sclerosis, anxiety, depression, ADHD and OCD, rheumatoid arthritis, fibromyalgia, shingles, and leaky gut syndrome. Beyond the body, Anthony brings his wisdom to bear on soul, heart and spirit as well, offering readers unique insights on how to find inner peace and live longer, healthier, richer lives.